Every four years the summer Olympics rolls around again and America tunes in to certain sports that it seemingly forgets about. Synchronized swimming is one of them. It’s a sport embodied by beautiful spectacle wrapped in athleticism and charm. The ladies of Verso are keeping that spirit alive and constant in Miami. The troupe is the brainchild of local artist Monica Lopez De Victoria and her partner Julie Lucas. Lopez De Victoria, known in Miami as one half of the collaborative art duo the TM Sisters, has been a synchronized swimmer since the age of 11, starting out with the Dade County Blue Sharkettes, where she met Lucas, and was a state champion and national finalist for 8 years. Lopez De Victoria, now 32, remembers the exact moment when she knew she would become a synchronized swimmer. 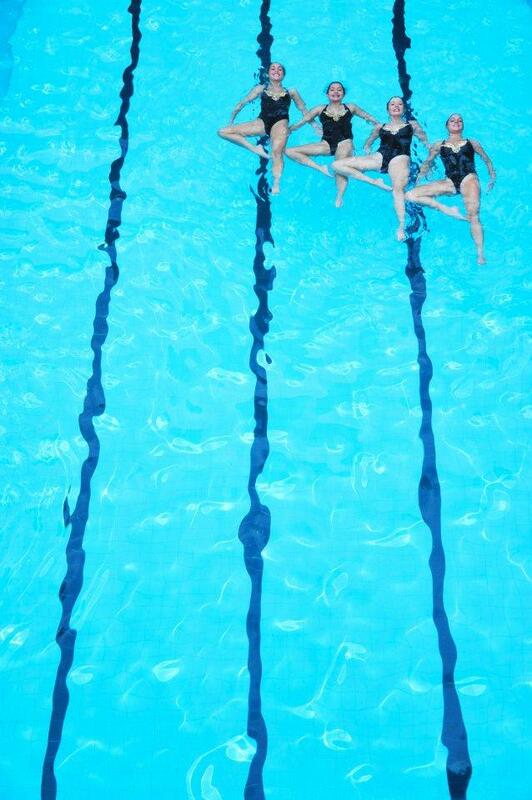 Synchronized swimming is beautiful and mesmerizing. With lithe forms floating through crystal blue water, it’s easy to forget that such seamless movement is actually rigorous exercise. In competition, swimmers are not allowed to touch the bottom. It’s a little known fact that some of the women choose not to shave their legs leading up to a performance, a practice that allows greater precision because you can physically feel your legs more. Athleticism is important to synchronized swimming. That’s part of what attracted Lopez De Victoria to it. “It takes years to learn just how to balance your body vertically with your legs up. With years of skill making, synchronized swimmers are really beautiful mermaids, totally comfortable in the water,” she said. According to Lopez De Victoria, there has been a recent surge in interest in the sport. “It’s a bit glamorous,” she suggested, “and it’s a bit unknown.” She speculates that the girls in Verso Performance, around 25 of them from many different parts of the world, need an outlet for a skill they honed so well in their childhood. Some of the girls have even competed at the Olympic level, but the shelf life of synchronized swimmer typically runs out in one’s early twenties. Those who trained for so many hours in their younger years are still looking for a conduit for that energy. Lopez De Victoria herself followed a similar path, competing seriously until college and then deciding to switch her career focus to art. She began coaching younger girls while turning her own practice into the performance group around five years ago. The art and the swimming often intersect in exciting ways. And that is an added benefit of Verso. They once performed at the Nada Art Show during Art Basel, but because of weather concerns, the party was moved inside. But the show had to go on, and the event still called for entertainment, so they presented an elaborate version of the practices that they do outside of the pool. They also performed to live electronic music at a Locust Projects event in an above-ground pool. Just last week they closed out Miami Swim Fashion Week in Chromat geometric bathing suits. The whole thing seems perfectly suited for the tropical climate of Miami and it’s not hard to imagine synchronized swimming in pools more often. With art starting to get a firmer grasp on the collective consciousness, and most people wearing a bathing suit a lot of the time, there’s no better place for Verso to thrive. Imagine sitting by the pool, celebrating whatever poolside party Miami has thrown at you. A few drinks and laughs and before you know it, the magical completeness of a team of “beautiful mermaids” begin to frolic along in perfect unison to the music and each other. It sounds pretty fantastic, eh? Let's all agree we need more of synchronized swimming.